The new report (pdf), compiled by the Institute and Faculty of Actuaries in Britain, claims that the new era of antimicrobial resistance (AMR) is already upon us, and that 50,000 people are already dying each year in Europe and the U.S. from untreatable infections. If nothing can be done to offset this trend, as many as 10 million people could die each year by the mid-point of the 21st century. That would make AMR worse than cancer. “The golden age of antibiotics which the world has taken for granted for well over fifty years has ended,” wrote Sally Davies in the report. 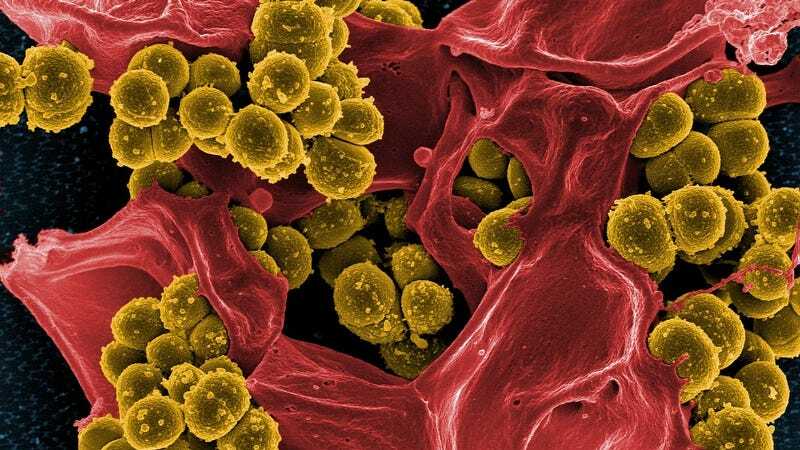 Davies, the chief medical officer for England, described the growing ineffectiveness of antibiotics around the world as being on the same level as terrorism and climate change. Indeed, infections that used to be easily treated, such as tuberculosis and gonorrhea, have reemerged a serious health threat. Antibiotics are also used to prevent infections, and without them, surgeries would once-again become life-threatening. Individuals receiving organ transplants would have to rely on their own immune systems to prevent their bodies from rejecting donor organs. Pneumonia would return as a frightening mortal enemy. In the report, British economist Lord O’Neill said that doctors and patients need to “stop treating antibiotics as sweets.” No doubt—the more that antibiotics are used, the less effective they become. O’Neill said this issue can no longer be ignored by politicians and the finance sector. He’s hoping that leaders of the world will make it a top priority at the upcoming G20 meeting to be held in China this September. The current pharmaceutical model also needs to be reworked, argued O’Neill. Drug companies make money by selling antibiotics, but this only serves to encourage the use of antibiotics. To address this, O’Neill is proposing a new way of repaying companies for their inventions via a “market entry reward.” This reward could be as high as $1.3 billion for the successful development of any new antibiotic that addresses an “unmet need.” The idea here is to sever the link between R&D and the price of a drug. Billions of dollars of reward money may sound like a lot, but if nothing’s done about it, AMR could cost the world economy $100 trillion by 2050. Which says nothing of the moral cost of inaction.